Wow, I Can't Wait for This New Cozy Mystery! 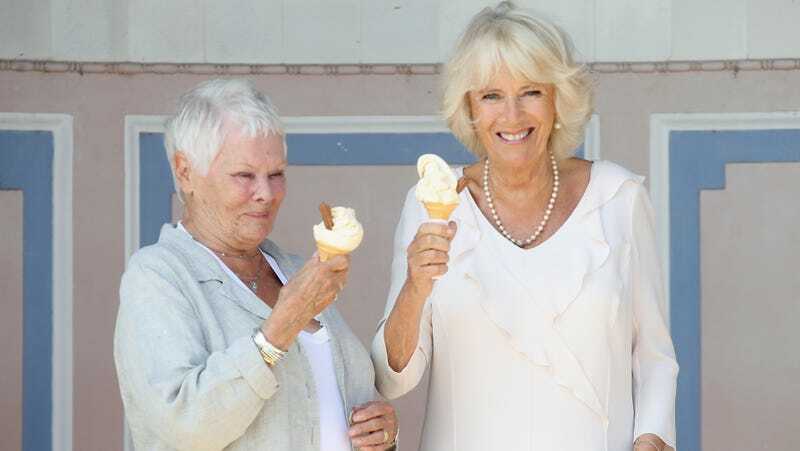 Truly I have never identified with anyone as deeply as I identify with Dame Judi Dench in this picture, looking delightedly at her ice cream cone, standing next to Camilla (formerly Parker-Bowles, currently Duchess of Cornwall). This picture comes from Camilla’s visit to the Isle of Wight—specifically Osborne House, one of Queen Victoria’s vacation homes, complete with private beach. Dench gave the duchess a tour, since she’s played the monarch in two movies, including Victoria and Abdul, which was filmed in part at the villa. The pair stayed cool as they chatted over a vanilla treat adorned with a candy stick. At one point, the 83-year-old actress even offered a napkin to Camilla, who wore a white dress with a string of pearls for the solo outing, when the dessert began melting onto her chin in the 75-degree heat. While the ice cream might have been welcome in the warm weather, Camilla admitted that what she really wanted was a swim in the water. “The temptation is great to have a quick dip like the Queen did,” she said. Truly, have you ever seen a more perfect image of seasonal contentment? Look, if the royalty thing doesn’t pan out, Camilla and Judi would be a great addition to the Masterpiece Mystery summertime lineup. Nothing would thrill me more than watching these two ask pointed questions of sketchy strangers about the body that just washed up on the beach of their cozy but strangely crime-ridden seaside town.